CNN Interviews #QAnon Nutbag Trump Cultists [VIDEO] - Joe.My.God. What is QAnon? Not even its strongest supporters really know. 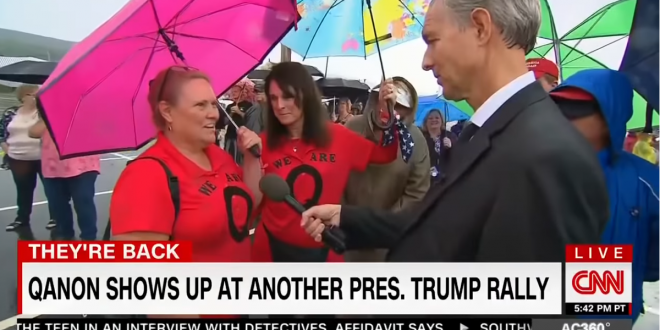 CNN’s Gary Tuchman bravely took to a rainy parking lot in Wilkes-Barre, PA to interview the tired, poor, huddled masses yearning to breathe Trump outside one of the president’s rallies. “It’s a shift. I can feel it coming,” Trump supporter Timothy Rasmussen told Tuchman. “Some call it the great awakening.” “QAnon is the people that believe in what Trump’s trying to do to change our country,” another supporter added. Tuchman asked one woman why she thought QAnon was a person or persons with high security clearance in the federal government. “Well, I’m just telling you, that’s what it appears to be,” she replied. “So you don’t have any proof of that. You’re just guessing,” Tuchman said. “And you don’t have any proof there isn’t,” she said. That’s just a taste. Watch the crazy.